One view of the proposed redesign for the Noroton Heights Shopping Center. 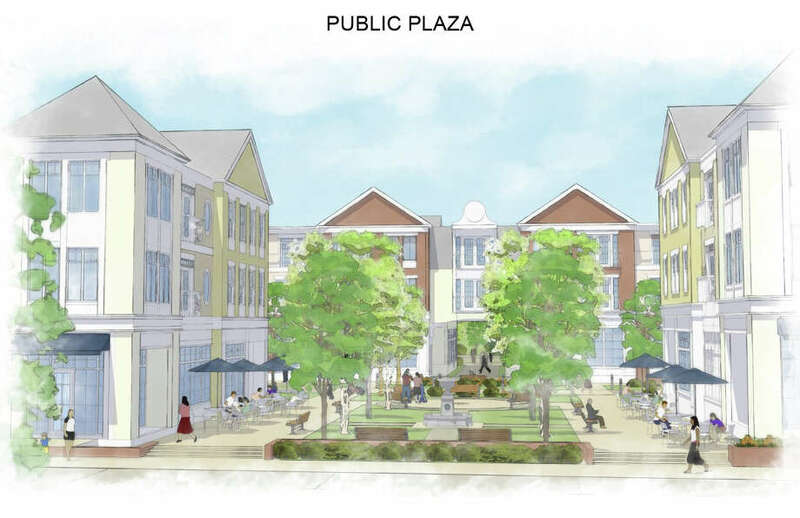 DARIEN — Redevelopment plans and proposed amendments to area zoning requirements for the Noroton Heights business district were recently unveiled at a meeting of the Planning and Zoning Commission. The results of more than a year of planning by two developers — one representing the Noroton Heights Shopping Center, or Palmer’s, side and the other representing the Federal Realty side — were shown to the public for the first time April 5, including renderings of the proposed Noroton Heights business district transformation. Attorney Bruce Hill, representing the Federal side, told the commission that the proposed redevelopment seeks to turn Noroton Heights into a “pedestrian-friendly, village-type area.” The plan, Hill said, would de-emphasize the “drive and park” aspect of the current district and instead create extensive sidewalks, public plazas and a more open building design to encourage an open flow of foot traffic. “This notion of the typical strip mall where you’re totally dependent on vehicular access is really directly contrary to contemporary ideas of proper planning,” Hill said. “The intent is to transform the Noroton Heights business district. And I think the intent is to transform it because the transformation is inevitable. I think the idea is to try to manage that in a sensible way,” Hill said. The plan includes the addition of mixed-use buildings in which the bottom floor would be reserved for commercial use and the top for residential. The residential buildings would require a change in restriction to allow for four story buildings at no more than 55 feet, as opposed to past restrictions of three-story buildings at no more than 45 feet. In exchange for the additional height of the buildings, attorney Bob Maslan, representing the Palmers side, said that all properties should be required to dedicate five percent of their space to public use. As a result of that stipulation, renderings by the developers showed more green spaces, plazas with park benches, fountains, plaques commemorating the area’s history, walking bridges and a large public clock above one of the plan’s designated green spaces. Palmer’s main public plaza would be roughly 100 feet by 70 feet, according to architect Joseph Schiffer of New Haven’s Newman Architects. Residential parking, said Robert Maslan, representing the Palmer’s side, would be separate from commercial, possibly in an underground structure. Commissioner Eric Voigt opined that there was little talk in the plan of connecting the Palmer’s and Federal side, split along Edgerton Avenue. The reason for the disconnect, Hill responded, is that properties on the south side of Edgerton are not owned by the redevelopers. Additional issues, like water drainage and traffic, are being investigated, said Hill. “What really makes a village is to have the office, the retail and residential. So I hope you’ll consider that,” she said.